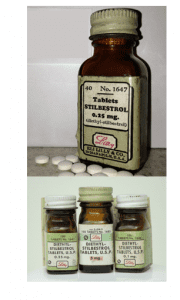 In 1938, DES (diethylstilbestrol) was the first synthetic estrogen to be created. DES was prescribed to millions of pregnant women, primarily from 1938 – 1971, but certainly not limited to those years. In some cases DES prescriptions were written into the 1980s in the U.S., as well as other countries, in the mistaken belief the drug prevented miscarriage and ensured a healthy baby. But it didn’t work and instead DES harmed the mothers who were prescribed it, the children born of those pregnancies and now possibly their grandchildren and beyond. Never patented, DES was cheap and easy to produce, so hundreds of drug companies made it in the U.S. and around the world. DES was marketed under numerous brand names. DES was prescribed if a woman had a previous miscarriage, diabetes, or a problem pregnancy with bleeding, threatened miscarriage or premature labor. 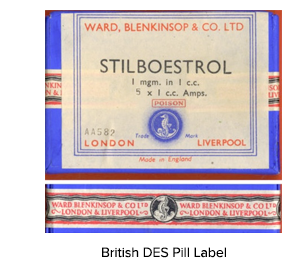 DES was prescribed primarily in pill form. Up until the mid to late 1950s some women were given DES shots. While the use of injections continued they were given less frequently as time went on. Another form of administration was via vaginal suppositories (sometimes called pessaries). DES also was included in the formulations of some prenatal vitamins, meaning individuals were exposed without actually having had DES specifically prescribed. (from first day of last menstrual period), and was increased every other week by 5mg per day through the 14th week. Then the amount was increased weekly by 5mg per day, from 25mg in the 15th week to 125mg per day in the 35th week. The Smith’s research claiming DES successfully prevented miscarriage had flaws. Their studies used no control groups and called for bed rest along with DES. Looking back, it seems likely the bed rest, and not the drug prevented miscarriage. But at the time drug makers were enthusiastic about DES. It was cheap and easy to produce so every pill prescribed made money for them. Of note is that DES was never patented, so it was produced by many drug companies and marketed using hundreds of brand names. One of the major U.S. DES producers was Eli Lilly and Company, which employed a sales force of drug representatives who heavily promoted DES to doctors, urging them to prescribe DES for their pregnant patients. Armed with copies of the Smith’s research they made their case well. 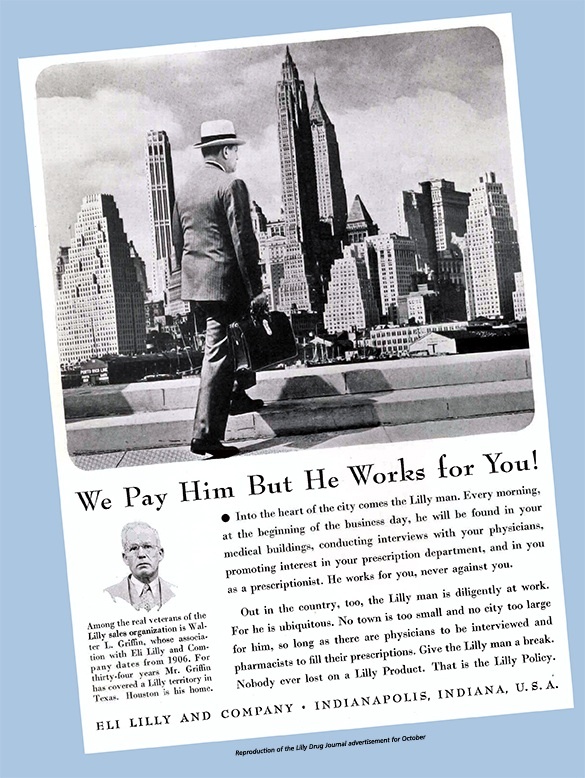 Lilly was proud of its sales force and even ran advertisements touting it in medical journals. This fascinating ad is from the 1940s and was provided by the American Institute of the History of Pharmacy. In it Lilly promotes its team of drug representatives ostensibly to help them get a foot in the door of doctor’s offices. In those days, with no direct to consumer marketing, drug companies heavily marketed their products to doctors. DES is an excellent example of how well that worked in convincing providers to prescribe specific drugs. In the late 1960s and early 1970s cases of the specific rare cancer, clear cell adenocarcinoma of the vaginal and cervix, were being diagnosed in young women. A cluster of them at Massachusetts General Hospital in Boston raised alarm among doctors who couldn’t figure out what was going on. It took a persistent DES Mother to unravel the mystery. She told doctors her belief the DES she was prescribed while pregnant was responsible. Ultimately, she was proven right. In November 1971, the FDA told doctors to stop prescribing DES for their pregnant patients, however it was never banned. Specifically, the FDA said DES was contraindicated for pregnancy use. In some rare cases American doctors either didn’t hear of, or simply ignored the 1971 message and continued prescribing DES. Internationally, DES use during pregnancy continued for many subsequent years. By September 2000, at the urging of drug companies the FDA withdrew approval of DES for use in humans because it wasn’t being prescribed anymore. It is still used by veterinarians, however, to treat incontinence in dogs. According to the Centers for Disease Control and Prevention, in the United States an estimated 5 million to 10 million people were exposed to DES, including women who were prescribed DES while pregnant, and the children born of those pregnancies. Now researchers are investigating whether DES health issues are extending into the next generation, the so-called DES Grandchildren, and no estimate of their numbers has yet been made. As study results come in, there is growing evidence that this group has been adversely impacted by a drug prescribed to their grandmothers. 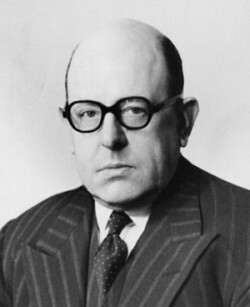 Interestingly, years after developing the chemical formulation for DES, its creator, Sir E. Charles Dodds was knighted for his accomplishment. It was fully expected in 1938 that his synthetic estrogen would help women worldwide by relieving the estrogen deficiency symptoms of menopause. But almost immediately studies began raising alarms of cancer in animals. Still, those concerns went unheeded in the rush by drug makers to promote this powerful drug for it’s new-found use as a miscarriage preventative. As a synthetic estrogen-like compound, the molecular structure of DES differs from natural estrogen, giving it greater potency. 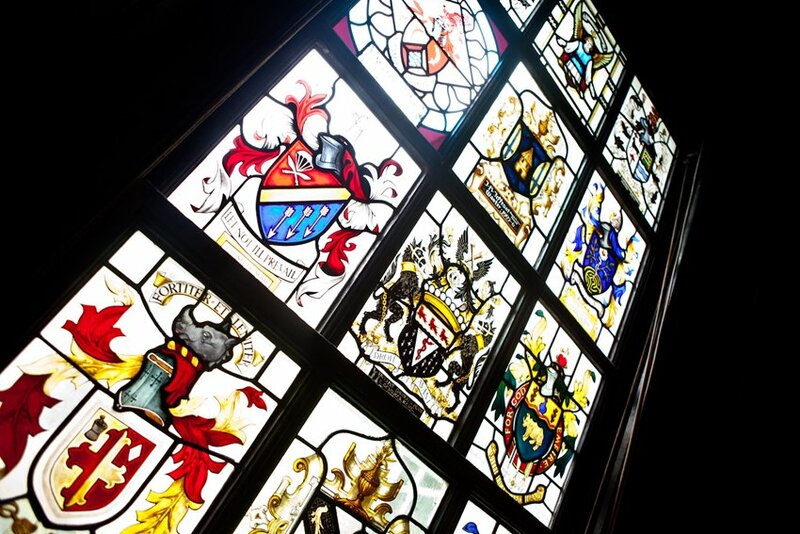 Because he was a Master of the Worshipful Society of Apothecaries of London, Dodds was honored for his work on DES with a fascinating stained glass panel at their headquarters. It’s part of a grouping of panels in the Great Hall representing the coats of arms of each of those who were honored. The Dodds stained glass is just out of view in this photo, which shows how the panels look. In a nutshell, the Dodds image shows a woman at the top holding a book open to the formula for DES. Further down, a knight’s helmet signifies that Dodds was knighted for creating DES. A hand hanging down depicts Dodd’s work in medicine and the pierced crabs (flanking the hand) represent Dodd’s interest in fighting cancer. 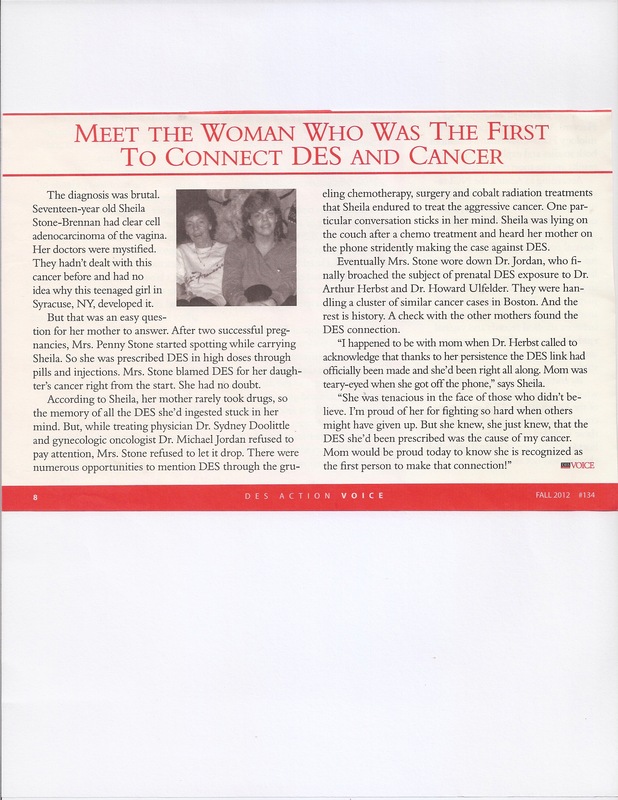 Dodds developed the motto: “Deeds Not Thoughts.” Years later, he raised concerns about DES, but sadly, by then very few in the medical field were listening. DES was the first compound to be identified as an endocrine disruptor, meaning it interferes with the way a body’s endocrine system functions. The results are cancers, infertility and reproductive abnormalities. Harms caused by endocrine disrupting chemicals are now known to be the most severe when exposure occurs during fetal development. The study of endocrine disrupting chemicals was sparked by the DES experience. Research is continuing with new adverse health impacts being identified. The DES experience is a true medical tragedy brought on by less than adequate drug testing, heavy promotion by pharmaceutical companies bent on making a profit, and lax government regulation. While DES is no longer prescribed for human use, those who were exposed to the drug are left dealing with the health and emotional consequences it caused. Consult this DES Timeline for a historical overview of the DES tragedy.